In the fall of 2000 my partner, Alysa, and I found ourselves with a hole in our schedules. Alysa was finishing her second degree and I found myself at the end of a long contract with a software company. 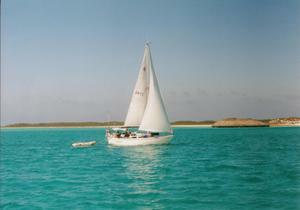 We had been saving money to buy a house, but decided instead we would buy a sailboat and sail around. Looking back I am amused at the naivite of this idea. We had no boat and neither of us knew how to sail. I had some experience canoeing and believed that the basic principles would extrapolate. Alysa was a "South of Steeles" city girl. The whole thing would have probably never happened had it not been for Okanagan cherries. To make a long story short, I happened to buy a copy of A Sea Vagabond's World by Bernard Moitessier. I have no idea why I bought that book. 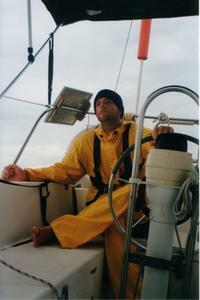 But in the following weeks I became fairly obsessed with the book and about voyaging in a sailboat. A few months later I bought a 30 foot sailboat. A couple weeks after that I asked Alysa to sail away with me. She agreed, which is surprising because she is otherwise a sensible person. We hatched a basic plan: leave in September, go to the Bahamas for the winter and return to Toronto in June. Cassiopeia was in Midland on Georgian Bay, 120 km North of Toronto. Because of this we would need to begin our trip by making a transit of the Trent-Severn waterway, which connects Georgian Bay with Lake Ontario. From Lake Ontario we would take the Erie Canal to the Hudson River, take the Hudson River to the Ocean, and then take the Intracoastal Waterway South to Miami. If we made it to Miami without killing ourselves and we wanted to continue we would head to the Bahamas. We would head home before hurricane season was in high gear (July or so) and retrace our steps home. Mostly by chance we chose a good boat. Cassiopeia was a Catalina 30 - a popular boat for many reasons. She was solid and affordable. She was called Cassiopeia because that was the name painted on her when we bought her. I didn't get around to renaming her until the name had grown on us. Cassiopeia is something from mythology, and also happens to be a very recognizable constellation also known as "the W". On our trip South in the fall, Cassiopeia was high in the sky after sunset, a fact that gave me a queer reassurance that our plans and the great spheres were in alignment. Reassurance was hard to come by. There was ample discouragement from fellow sailors. We were warned of rampant piracy, storms, sharks, cabin fever... SCURVY! We were urged to wait until we had gained more experience. We were told that Cassiopeia would never survive the trip because of her [fill in the blank]. We were told that we could not do it without all sorts of equipment that we ultimately did not need. In general we found that sailors in general likely to discourage. Perhaps sailors were more likely than the average person to have already talked themselves out of the same dream. I took heart in words from Moitessier: "Once the bow is pointed towards the sea, you can always make due." Alysa and I were living in an apartment before we left on our trip. We stored what we could, gave away a lot of stuff and moved onto our boat. It was a tight fit for two people who had been living independent lives for many years. Honestly, we drove each other fairly nuts for the first 4 weeks and then got into a new pattern. To appreciate what this is about, get a friend and spend 72 hours in your car without getting out. The first leg of our trip was the Trent-Severn canal, which we rushed through in a week. Looking back I wish I had taken my time on the Trent-Severn, because it was really a wonderful trip. We moved our few bits of gear onto the boat, had a farewell party (we can't backout now) and had several tearful goodbyes at our slip at Outer Harbour Marina while we awaited the return of our autopilot which we sent away for repair. After waiting a few extra days we decided we didn't need an autopilot and we were off.